Allow me to introduce Adam Miller: writer, editor, curious traveler and the guy to stay up with way too late talking about music. He cooks too, and offered to reveal his family’s Spiced Nut recipe for the holidays. So Adam can now add Good House Guest contributor (our first!) to his list of distinctions. Thanks Adam! Follow Adam around on Twitter and read more of his food writing here. A batch of these savory-sweet snacks would make an excellent gift for upcoming Hanukkah, Christmas or New Year’s parties. Adam suggests presenting them in a Mason jar with a ribbon. We guarantee everyone will, er, go nuts for them. My mom and aunt have been making spiced pecans and almonds for years. I’ve always loved them. A bit sweet, a bit salty, and a bit spicy—they’re the perfect snack. They’re also great in salads and an impressive garnish to add to a cheese plate. Funny thing about these, though, is that I never considered making them myself. Just seems like it must be a lot of fuss, right? Make sure the nuts you buy are raw. Raw nuts are available pretty much any place that sells nuts in bulk. This recipe is for one pound of nuts. I use a mix of almonds and pecans, but I’m sure you can do it with any combination. Preheat your oven to 250°. While the oven warms, prepare the mix by separating the egg and discarding the yolk. Beat the egg white with 1 tbsp. of water until frothy. In a separate small bowl, combine all the spices (everything except the nuts). Blend the spices and add to the egg white mixture. Mix well. Add the nuts and fold in until all are coated. Spread the nuts across a non-stick or lightly oiled cookie sheet. Bake for 40 minutes. Stir and bake for 30 more minutes. Allow nuts to cool and store in an airtight container. *Chili powders vary greatly. I found that the one I was using was a little too salty and not spicy enough, so I only used half a Tbsp. of the chili powder and added half a Tbsp. of cayenne pepper. You could also make your own with cumin, cayenne, a bit of salt, and whatever else you enjoy! Really, the spice mix can be tinkered with a lot. 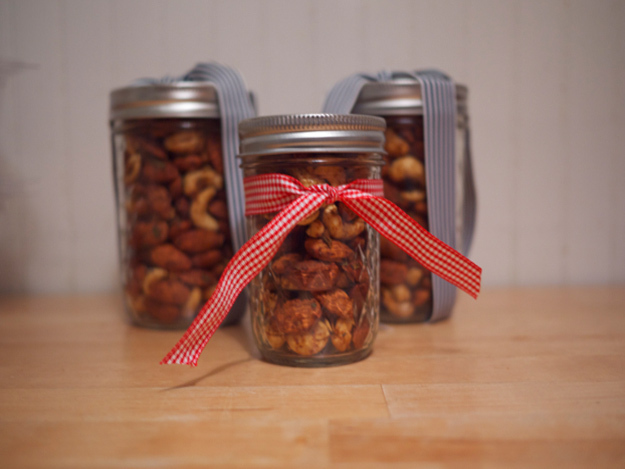 This entry was posted in create and tagged Adam Miller, recipe, spiced nuts by lhouse. Bookmark the permalink. I can say from personal experience (too much, ate way too much) that these are unbelievably delicious and addictive. I received a jar from Laura for the holidays and I’m embarrassed to say I ate the whole thing far too quickly than was intended.